This Incident Report describes the shooting and subsequent death of Saw A---, a villager from B--- village, Htee Tha Daw Hta village tract, Bu Tho Township. Saw A--- was shot on March 15th 2015 between 7 and 8 pm. The perpetrator was Private Saw Kyaw Ka of Border Guard Force (BGF) Battalion #1013 Company #3, led by Company Second-in-Command Hpah Yuh Khay. The villager was on his way to go spear fishing when he came across the BGF and was shot by accident, as it was already dark outside. 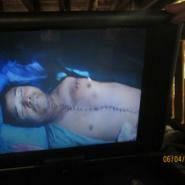 When the injured villager protested the BGF shooting of villagers, he was shot twice more. The BGF left Saw A--- at the place where he was shot and he was only sent to Hpa-an Hospital when his fellow villagers came for him later that night. He was under treatment for two days before passing away in the hospital on March 17th 2015. He was buried in the graveyard of Hkaw Taw Town. As a result of Saw A---'s death, his family has been facing livelihood issues so his wife met with Battalion #1013 Commander Maung Hla Kyaing to demand that he compensate her by providing her with financial support for one month. Although the commander agreed, no compensation has been paid out yet. The following Incident Report was written by a community member in Hpapun District who has been trained by KHRG to monitor local human rights conditions. It is presented below translated exactly as originally written, save for minor edits for clarity and security. This report was received in July 2015 along with other information from Hpapun District, including five other incident reports, 41 interviews, one situation update, and 82 photographs. I got this information from a radio [walkie-talkie] message. After that I followed up with the victim’s family and the other people who were included [present] during the [time] the incident was taking place. I followed up on it [the incident] to get detailed information. The people who provided information know the details [of the] incident because they were also included [present] when the incident was happening, therefore they know detailed information. It happened on March 15th 2015 in the evening when [the victim] went spear fishing between 7 and 8 pm. When [he] went on the way to go spear fishing, Company #3 Platoon Commander Hpah Yuh Khay and his private who are [under] BGF Battalion #1013 killed [shot] Saw A---. On March 15th 2015 in evening at 7 pm, a B--- villager, Saw A---, [who is] also called Saw C---, decided to go [out] on his own to catch fish for his family. [He lives] in B--- village, Htee Tha Daw Hta village tract, Bu Tho Township. He does not have [eat] meat and he is a vegetarian [but] even though he does not have [eat] meat he did his best to find food for his family and children. In the same evening, before he reached the river at F--- [place], he encountered the BGF. He was directly shot by the BGF unexpectedly. It [the bullet] hit [him] under his breast and he fell over [on the ground]. 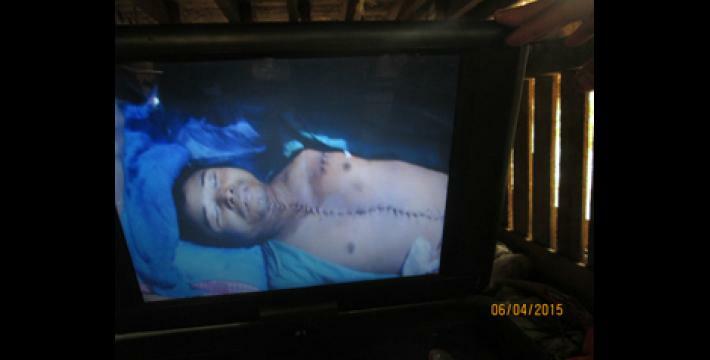 He told the BGF, “We are villagers, why do you shoot us?” The BGF [soldiers] looked at him and shot him again, twice. It [a bullet] hit his shoulder and his left shoulder was broken and one of his fingers was cut off. After the people [villagers] brought him to his house he was sent directly to Hpa-an Hospital. The BGF [soldier] who shot Saw A---, [who] is [also] called Saw C---, [his] name is Saw Kyaw Ka. [He] was led by Hpah Yuh Khay. The battalion commander of BGF [Battalion] #1013 is named Maung Hla Kyaing and [his] battalion second-in-command’s name is Kyaw Win. The BGF soldier [Saw Kyaw Ka] shot B--- villager [Saw A---] by accident, but they [the BGF] did not do anything with the corpse [injured villager]. They just left the corpse [injured villager] and moved onward [to their destination]. They did not create any rules [that villagers were supposed to follow] before they shot and killed the villager by accident. They did not say [that] starting from [the] evening [and] until morning you are not allowed to go out of the village. Since they killed the villager by accident, they said, “We created the rule in our area that we are not allowed [to let] any villagers go out of the village after 6 pm and until 6 am.” However, the villagers which we conducted a meeting with reported that they did not hear [about this rule], nor saw any [signs or notices about the rule] with their [own] eyes. Saw A---, [who is] also called Saw C--- and who has been killed by the BGF, his family is facing livelihood problems since [he died]. But the wife of Saw A---, [who is] also called Saw C---, arranged a meeting with the BGF [Battalion] #1013 commander to help her with the [basic] needs of her household. She demanded of the commander, “How many soldiers [are there] in a battalion? You have to take one month’s salary from all of them and give [that money] to me [to support me] during one month.” The commander agreed with her, but as of now, he has not given [her] anything yet. The family of Saw C---, [who is] also called Saw A---, [has] six children and most of his children are old enough to go to school, but one or two children are not ready for going to school yet. Therefore, it [their father’s death] brought on problems for them [since the older children have] to help their mom and their younger siblings [at the expense of their education]. The [family of the] victim gave us permission to use this information openly. The researcher mistakenly refers to Hpah Yuh Khay as a platoon commander here, however, as indicated above and in other KHRG reports, Hpah Yuh Khay is in fact a company second-in-command. KHRG continues to receive reports discussing abuses involving BGF Battalion #1013 and #1014, including: “Human rights violations by Border Guard Force (BGF) Battalion #1014 in Bu Tho Township, Hpapun District, May 2012 to March 2014,” KHRG, July 2015; “BGF Battalion #1014 forced labour and forced recruitment, April to May 2012,” KHRG, June 2013;"Papun Situation Update: Bu Tho Township, November 2011 to July 2012," KHRG, April 2013; “Papun Situation Update: Bu Tho Township, August to September 2012,” KHRG, April 2013; and “Papun Situation Update: Bu Tho Township, July to October 2012," KHRG, April 2013. Further reports detailing abuses involving these battalions are also available on the KHRG website. In a previous KHRG news bulletin discussing this incident, a KHRG researcher indicated that the BGF stated they had shot the villager by accident, as it was dark and they believed he was a KNLA soldier. For the full report, see “Violent abuse and killing committed by BGF soldiers in Bu Tho Township, Hpapun District, March to May 2015,” KHRG, July 2015. B--- village, in which the victim resided, is part of this area.